Here's what you need to know now for Wednesday, Nov. 8. Most were baffled when they saw that $130 billion, Broadcom Ltd. (AVGO - Get Report) - Qualcomm Inc. (QCOM - Get Report) deal float over the wires earlier this week. It was surprising in the sense that the two companies are some of the largest in their field and consolidation at the top like that is rarely based on sheer size. But in the world of semiconductors, it should be noted that M&A is par for the course. A healthy average of 42 deals have been done in the chip sector each year since 2007, according to data from M&A, private equity and venture capital database PitchBook. But the average size of each deal has risen considerably. In 2014, the median semiconductor deal size was $200 million, up from $33.5 million in 2013. Since then, the median deal size has consistently been above $150 million. And this year's levels are already headed in that direction. Both Cypress Semiconductor Corp. (CY - Get Report) , which focuses on flash memory, and analog chipmaker Microsemi Corp. (MSCC said in recent earnings calls that spending on M&A makes more sense than pursuing organic growth. Meanwhile Samsung and Intel Corp. (INTC - Get Report) have also been rumored to be interested in deals. So with further consolidation in the cards, TheStreet digs into potential targets fabless chip company Ambarella Inc. (AMBA - Get Report) , which makes chips that power video processors in GoPro (GPRO - Get Report) drones and other cameras, as well as Mellanox Technologies (MLNX - Get Report) and Marvell Technology Group Ltd. (MRVL - Get Report) , both focused on data center chips. Some pie-in-the-sky scenarios could also see Micron Technology Inc. (MU - Get Report) or Advanced Micro Devices Inc. (AMD - Get Report) being scooped up, according to some on Wall Street. In retail, again, we highlight a company bucking the trend of Amazon.com Inc. (AMZN - Get Report) , which is eating everyone's lunch in all corners of the industry. Ahold Delhaize NV (ADRNY shares rose to a three-month high in Amsterdam trading Wednesday after the Food Lion and Stop & Shop owner posted stronger-than-expected third-quarter earnings and grew its U.S. sales despite intense competition from discount retailers and Amazon's move into food delivery. Ahold said net income for the three months ending in September rose 54% on a pro-forma basis to $385.3 billion. Ahold said its U.S. sales grew 0.8% to $6.4 billion at Giant and Stop & Shop, while Food Lion and Hannaford sales rose 2.2% to $4.4 billion. The company said margins improved, thanks to accelerated cost cuts, and expects those to rise further by the end of the year. The group also said that its delivery service Peapod was growing its customer base and performing well. By contrast, Kroger Co. (KR - Get Report) , Ahold's biggest rival, has lost around 38% of its market value so far this year. Officially 365 days ago, Donald J. Trump was elected the 45th president of the United States. On the anniversary of one of the most controversial presidencies in some time, TheStreet continues its coverage of Trump's first year. Today, we look at Trump's effect (or lack thereof) on banks, the peso and the overall market. Not to mention more on Trump and Twitter (TWTR - Get Report) . As promised, we've also got a fresh, intriguing photo for you. 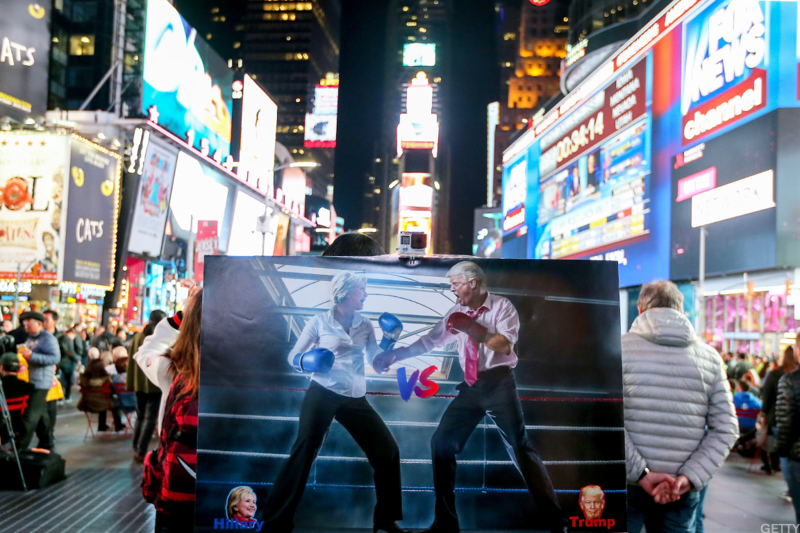 Above we show a graphic depicting Hillary Clinton and Trump squaring off in a boxing ring. The photo shows New York City's Times Square, where many people gathered on Tuesday, Nov. 8, 2016 to watch the surprising results unfold.